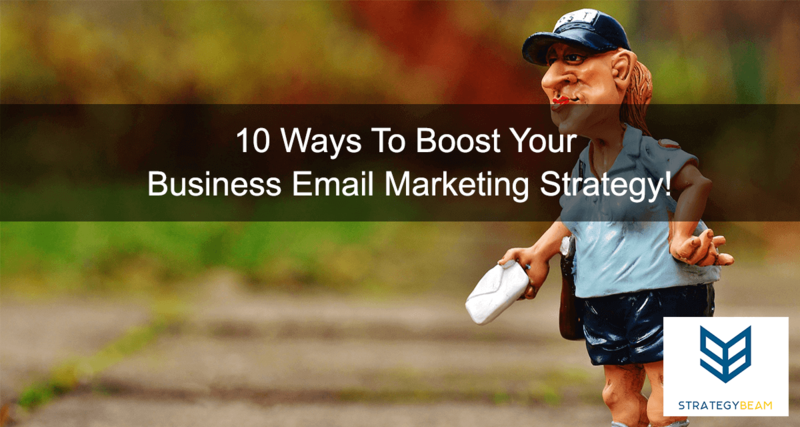 10 Ways To Boost Your Business Email Marketing Strategy! You already know how important professional Internet marketing services are for your business, but today I want to take a look at how to leverage email marketing to build the overall marketing strategy for your business. If you want to engage your audience and build a relationship with your customers, then email marketing is a must-have tool in your business marketing strategy. But how do you build a strong email marketing strategy that addresses the needs of your audience at all steps of their customer journey? Let’s take a look at some ways you can build a winning email marketing strategy for your small business! The best part about these tips is that you can leverage free small business marketing tools to research your audience, create great emails, and send your communication without having to spend a dime! There are many types of emails that your business should be using for your email marketing strategy. As you send emails be sure to track the proper KPIs so you know which emails work at what time and audience. Here is a list of the top 10 types of emails you can use for your small business marketing strategy to grow conversions and increase sales. Automated emails that deploy immediately after someone signs up for the email list. These emails are focused on upselling, building trust, and expanding influence with social media, etc. This type of email should have a conversational tone, contain no sales copy. Think of a Welcome Email as the “first date” with your subscribers! These emails solve a problem or answer questions the subscriber has concerning an area the business is an expert in. This type of email is your time to shine as the thought-leader and trusted source in your industry. I like to follow a 70/30 rule, where 70% of content is purely education and 30% of the email content is to promote the business. Be sure to track the right KPIs to see what content is received well, and adjust your content strategy based on your audience. This type of email is sent to subscribers who have not engaged with the small business in a set amount of time. Think of the Re-Engagement Emails as a way to rekindle old friendships with your subscribers, and don’t be afraid to offer something to capture their attention. Re-engagement emails are the cornerstone of customer retention tactics for your business and while it’s always best to maintain a relationship with your audience, this type of email is great to recapture the trust of your subscribers. Sent on a regular basis, these emails reinforce the brand as an industry expert. Newsletter emails are a great way to help your business build authority, trust, and engagement with subscribers through timely and relevant content. Newsletter emails tend to be longer and contain more content than other types of emails. Include things like blog posts, customer reviews, interesting news, and other relevant content. Due to the size and amount of content, newsletter emails tend to be sent at a lower frequency than other types of emails. This type of business email leads your subscribers through the customer journey while reducing the amount of time acquired by the sales team to drive prospects to action. Lead-Nurturing Emails need to be timely and behavior-based, so this type of marketing email should be automated. Be sure to focus on growing the relationship with your readers by using content from multiple channels like social, your website, and blog posts. This will help drive traffic to other sources of content from your marketing strategy and get your readers more involved with your brand. Thank You Emails are sent to a prospect/lead once they sign up for your email marketing list. It is well known in sales that your customers are most excited about your brand after they interact with your brand. The same is true with email marketing, so offer your subscribers a taste of your brand and what they should expect from your email marketing strategy. Some things to include in your Thank You Emails include: frequency of sends, type of content you will sell, and how they can get to know your brand more through social and your blog. Since this is your first contact through email, be sure to include copy that matches your brand to start the relationship. These types of emails are the trickiest to work with because they can become stale and drive readers away if used too often. Product Information Emails are similar to the Education Email but usually focus on a particular aspect of the brand with updates, offers, etc. The Product Information Email is the main sales email your business will send and is generally sent with a CTA linking to a custom landing page for each aspect of the product information displayed in the email. Creating a personal touch with a brand can be tough, but one of the easiest ways to do this is by featuring stories and updates about employees. Internal Update Emails can help drive interaction with your subscribers as you share information about your employees, business updates, etc. I have seen local Orlando business owners use this type of email to their advantage by sharing community updates and tips about their industry to help their readers on specific topics. Don’t sell anything in these emails, because this type of email should be like small talk with your subscribers. Sometimes one-off email campaigns should be developed and sent to a specialized group of the general audience. For example, after a conference, a campaign could be created with content tailored to the interests of only the group who went to the meeting. This content, design, and layout should be customized to meet the unique needs/desires of that group. One thing to remember is your copy needs to be tailored specifically to the theme/purpose you are sending the email about. This type of email is used to promote a specific social media channel, usually accompanied by a marketing campaign using that channel in conjunction with the email send. Keeping paragraphs short is vital since social media users tend to scan and consume content in a specific way. This means the email must be created to accommodate the unique consumption patterns and interests of this core audience. The brand can use interaction analysis to determine which users are most likely to interact and further customize sends to audience members based on these findings. Your business will help drive traffic and sales once you begin using the above 10 types of marketing emails in your business marketing strategy correctly. Each type of email should be used at a specific stage of the customer journey, and you can even use emails to help fill in the content gap of your industry. Business email marketing is not easy to set up for your small business, so be sure to contact a professional email marketing consultant. As you build your email marketing strategy, be sure to consider who is signing up for each email campaign, what content they are signing up for, and who your subscribers are. Your email marketing efforts should be built around the needs and expectations of your subscribers so you can optimize your growth and conversions. Now it’s your turn. What type of emails do you use for your busines email marketing strategy? Let us know in the comments below!